Transit riders are one step closer to ditching that stack of monthly transit passes and switch to a single card they can use to ride the train and make other purchases. Two more agencies have jumped to the front of the pack in a push for an open-payment system that would allow riders to use a bank-issued contactless card for public transit instead of a transit-issued ticket or card. In September, the Chicago Transit Authority issued a request for proposal for implementation of an open-loop payment program. Also that month, the U.S. Department of Defense put out a request for information on the addition of transit payment capabilities to its Common Access Card. “This is an evolutionary thing that’s happening right now,” says Phil Dixon, director of new product development for San Diego-based Cubic Transportation Systems, which provides fare payment infrastructure systems for the mass transit industry. In February 2009, the Utah Transit Authority became the first U.S. transit agency to launch a fare collection system that accepts contactless credit and debit cards from American Express, Discover, MasterCard and Visa. Open-fare pilot programs have also taken place with the transit authorities in New York, Los Angeles and San Francisco’s Bay Area. Additionally, an active procurement is underway for Washington D.C.’s transit system. Transit agencies are hoping to save money on ticketing and staffing by switching to an open-payment system. With closed-payment systems, the transit agency must buy the ticket stock and contactless cards, issue the fare media and provide support when customers have problems with their transit passes. An open-fare system could change that. “If you have a problem with your card, you’d call your bank first,” Dixon says. 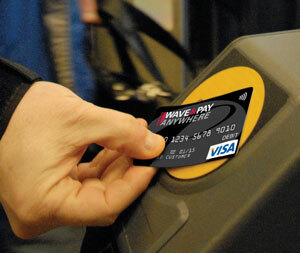 Increased convenience for riders is another advantage of an open-loop payment system. “If you were able to show up and present your contactless bank card at the gate, you wouldn’t have to stop anywhere and buy the ticket,” Dixon says. The next-generation CTA pass is expected to be a contactless smart card that operates as a standard credit or debit card, enabling riders to pay their fares and also use the card for other purchases. It is envisioned to be a prepaid card that would enable customers the option of whether or not to tie the card to a bank account. CTA riders could also pay their fares with a bank-issued contactless credit or debit card. The current fare equipment was installed in 1997 and is reaching the end of its useful life, according to the CTA. They hope to be able to update the fare equipment without an upfront capital cost but still own the equipment installed by the vendor. They also expect to maintain control over fares. In the first phase of the bid process, CTA received proposals from 12 private sector teams. Cubic is among those pursuing the contract. The transition is expected to save CTA the money it currently spends to issue transit cards and to manage the fare payment and collection system. “Reducing our expenses by continuing to leverage emerging technologies allows us to maximize our limited financial resources,” says Chicago Transit Authority President Richard Rodriguez in a statement. The CTA expects to begin the transition to an open-fare system this summer. In Washington, D.C., there is a heavy population of Department of Defense employees with Common Access Cards and there’s an interest in using those cards for transit payments. The Common Access Card is the standard ID for active duty military personnel, selected reservists, civilian employees and eligible contractor personnel. “It would be good for the transit agency because it’s one less card for them to issue and manage,” Dixon says. The agency is seeking information from vendors on the addition of open-loop payment functionality to the credentials. Because the Common Access Card is compliant with FIPS 201, this approach could eventually be deployed on PIV credentials throughout government. The Defense Department wants an application that can work as a prepaid solution that is funded from single or multiple sources. The RFI states that the card should be fully functional in U.S. public transportation environments where the system architecture is compatible. Responses to the RFI were due in October. In line with the payment trend, Cubic has been branching out to develop more open-fare payment systems and is pursuing contracts in the United States and Canada, including Chicago, Philadelphia and Toronto. In September, Cubic was selected to conduct an open-loop payment pilot for Philadelphia’s Port Authority Transit Corp. The pilot, that will involve commuter trains between New Jersey and downtown Philadelphia, is scheduled to begin in early 2011. Cubic is the principal provider of ticketing operations for the Transport for London system and its multi-use Oyster card. Cubic and Transport for London previously worked with Barclays Bank in London to develop a card to host both the Oyster transit pass and Barclaycard Visa on a single piece of plastic. The first Barclaycards to include Oyster were tested in London in 2007. Now, Cubic is working on a full open-payment system for London’s buses to accept contactless credit and debit cards from Visa, MasterCard and American Express. The initial bus launch is scheduled to take place in early 2012, in time for the Summer Olympics that will take place there. If successful, the system is slated to later expand to the London Underground.